Gold has been trading in a tight box around $1,660/oz today, as eurozone finance ministers meet in Copenhagen to discuss the scale of the permanent “bailout fund” set for July. Gold has been stuck in range of roughly $1,630/oz to $1,700/oz in recent weeks as risk appetite has returned after the latest European debt “solution” which saw the battered can kicked down the shortening road once again. Nothing has been solved with regard to the European debt crisis, and debt crises in Japan, the UK and the US now loom. The misguided panacea of heaping debt upon debt and shifting debt onto government balance sheets, debt monetisation and currency debasement is leading to continuing currency devaluations internationally. Despite this or maybe because of this - risk appetite returned with a vengeance as evidenced in equities internationally rising to multi-month and multi-year highs and the slight weakness in gold in March. So far in 2012, gold has performed well and is set to end the first quarter in 2012 with gains in all major currencies. Gold is 6.3% higher in US dollars, 3.2% higher in euros, 3.1% higher in pounds, 2.25% higher in Swiss francs and 12% higher in Japanese yen which fell sharply in the quarter. Gold’s London AM fix this morning was USD 1,660.75, EUR 1,245.31, and GBP 1,038.68 per ounce. Yesterday's AM fix was USD 1,655.75, EUR 1,245.86 and GBP 1,041.22 per ounce. Gold fell $3.00/oz or 0.18% in New York yesterday and closed at $1,660.10/oz. Gold traded sideways in Asia prior to seeing a slight climb to $1,665.55/oz in late Asian trading and is now trading in Europe near $1,662.65/oz. Gold has been trading in a tight box around $1,660/oz today, as eurozone finance ministers meet in Copenhagen to discuss the scale of the permanent “bailout fund” set for July. Gold has been stuck in range of roughly $1,630/oz to $1,700/oz in recent weeks as risk appetite has returned after the latest European debt “solution” which saw the battered can kicked down the shortening road once again. Nothing has been solved with regard to the European debt crisis, and debt crises in Japan, the UK and the US now loom. The misguided panacea of heaping debt upon debt and shifting debt onto government balance sheets, debt monetisation and currency debasement is leading to continuing currency devaluations internationally. Despite this or maybe because of this - risk appetite returned with a vengeance as evidenced in equities internationally rising to multi-month and multi-year highs and the slight weakness in gold in March. 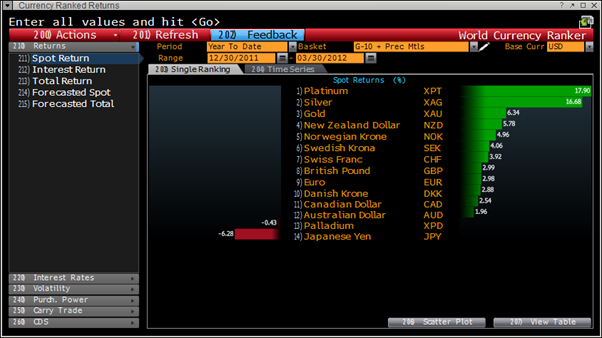 So far in 2012, gold has performed well and is set to end the first quarter in 2012 with gains in all major currencies. Gold is 6.3% higher in US dollars, 3.2% higher in euros, 3.1% higher in pounds, 2.25% higher in Swiss francs and 12% higher in Japanese yen which fell sharply in the quarter. Silver outperformed gold to the upside and rose 16% in dollars and 12% in pounds and euros, 7% in Swiss francs and 20% in Japanese yen. These currencies fell versus rare and finite gold and silver in the quarter and this trend looks set to continue in the coming months as negative real interest rates and currency debasement continue. The strike in India has slowed the physical demand for gold but there are signs that the 14-day strike may soon end which could be the impetus for a bounce in gold. Coin and bar demand in western markets has eased in Q1 as risk appetite returned and the public has again been lulled into a false sense of security. Global ETF demand has remained robust in March and in Q1, with global ETFs holdings have increased by 1.5 million ounces. Much of this buying is likely to be hedge funds and institutions rather than retail. Central bank demand is likely to have continued and there have been reports of many creditor nation central banks continuing to diversify their FX reserves. This trend will continue and there is also the possibility that some western central banks may also feel the need to diversify their meagre foreign exchange holdings into gold in order to protect against monetary risk and the real risk of a monetary or currency crisis. Canada will scrap the penny this year; nickel next? Bullion: Is it Part of Your Currency Reserve?